Keep those pricing strata in mind. In any case, because our Citi Bike data stopwatches every ride’s duration – in the very first field, in fact – we’re ready to run with that variable (inapt transportational metaphor there – sorry). And format to two decimals. 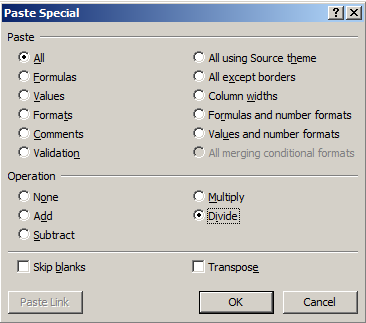 Paste Special Divide smartly substitutes for the traditional paste value routine – i.e., the inserted column, in which values in the source column are formulaically divided by 60 in the new column and pasted back via the Values option. Paste Special Divide here seems faintly circular, with a kind of self-referential division and paste-back slam-banged into the same cell. But it works. 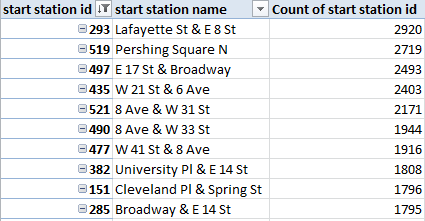 Once done, you could plant a simple AVERAGE in at the underside of column A and learn that the mean Citi Bike trip in February lasted 14.58 minutes, thus jibing with the riders’ purpose-driven riding intentions (that number compares interestingly with Washington DC’s 13.75-minute average for the first quarter of 2014; see those data here). Citi Bikers probably have to get somewhere soon; exercisers and riders in the park don’t start their picnic just 14.58 minutes after they’ve screwed their helmets on. 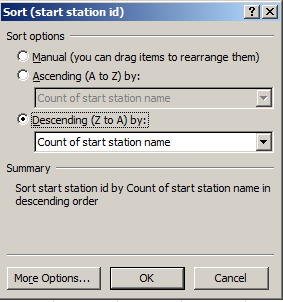 Now sort the durations in descending order and look for the value 45. 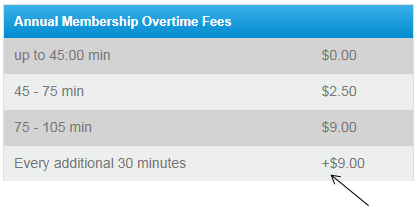 Again, that’s the threshold in minutes after which the Citi Bike billing scheme begins to achieve lift-off. You’ll find that the 45ers and beyond command 2921 rows, or an intelligibly small 1.3% of all the February rides. But look at the first record. It archives the activity of a woman, née 1982, who decoupled her cycle from the South Portland Avenue and Hanson Place dock in the Fort Greene quarter of hippest Brooklyn at 3:52 on February 8, and redeemed her vehicle at the posh Grand Army Plaza and Central Park South station, hard by the Plaza Hotel, at 12:41 on February 17 –12768.47 minutes, or nearly nine days, later. What went on here? Do we have a case of extreme right-tailed forget fullness, or a grave Citi Bank typo? Or is there a tale to be told about those nine wintry days in February? I for one am clueless, but cluelessness begets its prodigies of speculation; and at the very least I sense a New Yorker short story in there, or a maybe a TV movie. How about Clare Danes for the lead? I do go on, but there one thing about the cyclist who wasn’t there that we can know for sure. Throw 12768.47 minutes into Citi Bike’s multivariate pricing equation and go figure; and when the lead snaps in the pencil the total charge for our lady in (the) red reads … $5057.88. You’re welcome to check my math, but I get 419.116 half-hours at $12 per, and she was probably charged another 12 bucks for the .116 besides. Does anyone have Clare’s number? 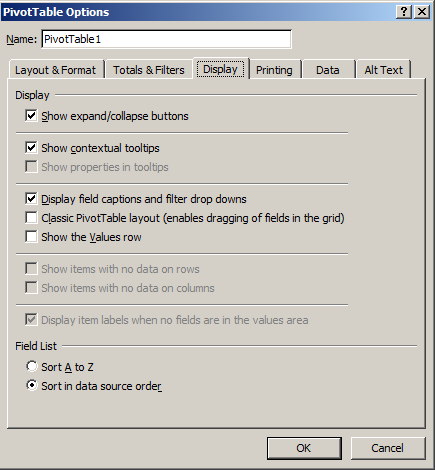 Then right-click in the Row Labels and click Filter > Top 10… and click ok in the resulting dialog box. It helps to be a New Yorker here, but if you aren’t, trust me – all of the above are in Manhattan. Tick off that first display box. Again, the analytical possibilities here are quite considerable. 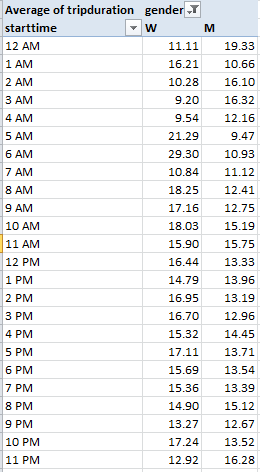 How about breaking out average trip durations by both time of day and gender? There’s quite a bit more to look at in here, but I gotta go; my movie idea is gaining traction, and I mustn’t keep Harvey Weinstein waiting. He takes my calls, you see. Hey -we went to the same high school.